A nightmare come true - Silas is captured by mage hunters. Determined to rescue the man she loves, Lainie braves the perilous journey through the Gap to follow him and his captors into the mage-ruled land of Granadaia. There, she discovers a betrayal beyond imagining and a deep-rooted conspiracy that threatens the safety and freedom of the settlers in the Wildings. Alone in a strange land, with no one she can trust, Lainie must find a way to free Silas and put an end to the danger facing their beloved Wildings. 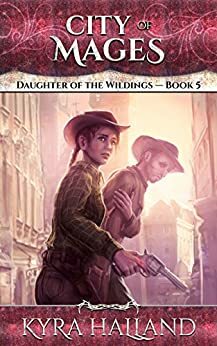 Book 5 of Daughter of the Wildings, western-inspired fantasy filled with magic, adventure, and romance. Contains language and violence. Kyra Halland has always loved fantasy. She has also always loved a good love story. She combines those two loves - like chocolate and peanut butter! - by writing the kinds of romantic fantasy novels she loves to read. Complicated, honorable heroes; strong, smart, feminine heroines; magic, romance, and adventure; deep emotion mixed with a dash of offbeat humor - all of these make up Kyra Halland's worlds. Kyra Halland lives in southern Arizona. She's a wife, mom and mom-in-law, proud grandma, and devoted servant to three cats. 5.0 out of 5 starsI love this series more with each new book I read. Lainie and Silas have become two of my favorite characters. They have such strength of character. They live their lives by the belief that all people are entitled to equal rights. Even while being persecuted by those who want things to remain unchanged and those who they are trying to help. Even so they do what's right. Add magic into the mix and you have an exciting story. 5.0 out of 5 starsAnother terrific read! This is the fifth, and penultimate, part of the Daughter of the Wildings series of western fantasies, and this is the moment I've been looking forward to from the start. Finally, we get to leave the Wildings behind temporarily and visit Granadaia, the home of rogue mage Silas, and the place where mages are the wealthy aristocrats, and those without magic (Plains) are not much more than slaves. At the end of the fourth book, To The Gap, Silas had been shot and captured by mage hunters, to be taken back to Granadaia. It's all down to his wife Lainie, Wildings-born and a mage with both Granadaian and Wildings abilities, to ride to the rescue. Although I missed Silas, it was wonderful to watch Lainie rise to the occasion and work out ways to find her man and then rescue him, almost single-handed. The opening of the book feels a little bit like a rehash of the cattle-drive in To The Gap, although this time there are Granadaian mages alongside the hands, and Lainie has to steer a careful course between the Wildings folk, who are suspicious of all mages, and the Granadaian folk, who are suspicious of untrained mages. However, luck falls her way, seemingly. Granadaia is fascinatingly different from the Wildings. Some aspects felt a little bit modern, but it felt believably different from the western-style Wildings - instead of the desert, with its capricious flash-floods, Granadaia is a lush, green place, all its land given over to intensive agriculture (which is why they need the Wildings cattle), tall cities and the estates of the mages, of course. I have to say, I found it fascinating to see a society where mages are the ruling class, not just tools to be used and controlled by those in power, but actually wielding all the power themselves. And Silas’s family is very much part of that controlling power. This was very much a ‘meet the relatives’ story, and all the more fun for that reason! The ending is suitably nail-biting, and if I didn’t find the final magely shootout totally convincing (I know Lainie’s powerful now, but even so…), it was still hugely enjoyable. This wasn’t quite the pleasantly adventurous romp of some of the previous books. Seeing Silas in captivity was gut-wrenching, and the author used the symbolism of Silas’s hat to remind the reader constantly of what was at stake. And OMG, I would never have thought the single word ‘Friend’ would reduce me to tears. Another skillfully written chapter in the series, which neatly resolves one problem while setting the scene for (hopefully) an even bigger showdown in the final book. I can’t recommend this series enough! Five stars.